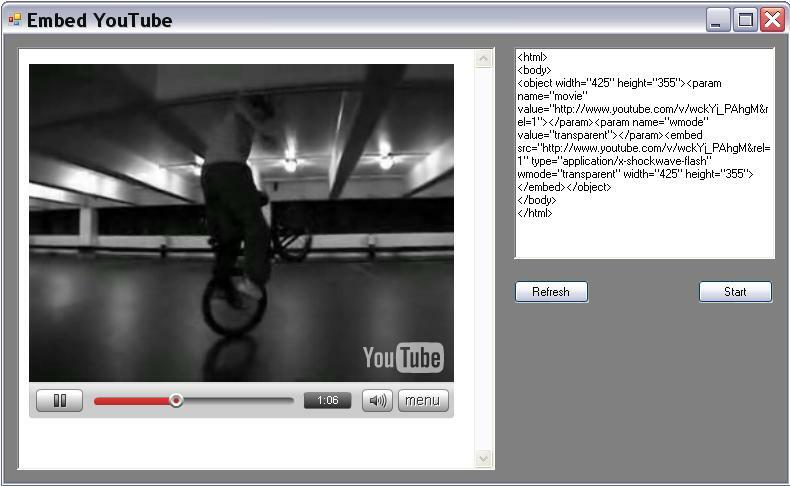 This sample will let you embed/stream web based Flash video into an application. To add the WebBrowser control to your toolbox, open the "Tools" menu and select "Choose ToolBox Items...". Select the COM Components tab, check the box next to Microsoft Web Browser, and click OK. The new Microsoft WebBrowser should be added to the Toolbox now. 'Load the new HTML file into the browser, so we can watch the video in our app. Note: 'When the "Start" button is clicked, the application creates/overwrites a new file (Application.StartupPath & "\321.html"). The application then loads the new HTML file in the web-browser, click the "Play" button on the Flash video. The HTML file can be found in the "Embed_YouTube\bin\Debug" folder. What should happen when I haven't install Adobe Flash Player addons ? Thanks, to the Admin. for the fix on the download links. I am unable to download the sourcecode, could you please reupload it again? Re: Where is the sourcecode? Sorry about the download not working. I asked the Mod for help. Thanks for posting the link to the zip file, I tried to post that same link in the html editor 5 times, & every time I saved it it would remove half the link?? Here is a screenshot that I also tried to post above.